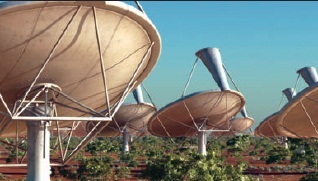 In case you haven't heard about it, the folks at the Square Kilometre Array (SKA) Organisation (www.skatelescope.org) are working on the world's largest and most sensitive radio telescope, to be completed in 2024. Upon completion, the telescope will be used to explore evolving galaxies, dark matter, and even the very origins of the universe, dating back more than 13 billion years. The scope will actually be made up of millions of antennas, forming a collection area equivalent to a square kilometer but actually spread out over an area more than 3,000 km wide. This will give the world a device that's 50 times more sensitive and 10,000 times faster than any previous one. The catch, however, is that it will generate a few exabytes (i.e., 1,000,000,000,000,000,000 bytes) of data every day — equivalent to double what presently goes over the Internet. This will take some pretty gritty processing power, plus enough storage for between 300 and 1,500 petabytes of processed data per year. Never fear, though, since the Netherlands Institute for Radio Astronomy (ASTRON) and IBM (www.ibm.com) have teamed up in the "design, engineering, and manufacturing of customized, high performance, low power analog and mixed signal processing chips for an SKA prototype system." With an initial grant of 32.9 million Euros, the five year collaboration will end up with a new supercomputer based in Drenthe, Netherlands at a newly established ASTRON and IBM Center for Exascale Technology. To keep up to date on the project, visit www.astron.nl. 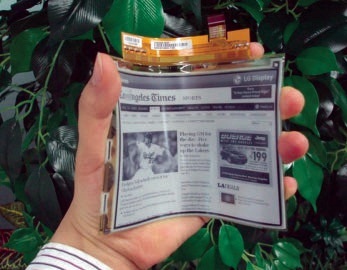 After years of hearing about future flexible displays — known as e-paper — it appears that the future is finally here. In late March, LG Display (www.lgdisplay.com) announced that it was starting mass production of "the world's first plastic electronic paper display (EPD) for use in e-books." The device is a six inch extended graphics array (XGA) screen (1024 x 768 resolution) that has a flexible design that allows it to bend as much as 40° from the center of the screen, is only 0.027 in (0.7 mm) thick, and weighs just 0.49 oz (14 g). In addition to the flexibility and weight reduction, the display will be more durable than current rigid ones which often are damaged by accidentally dropping or hitting them with an object. LG's tests showed that with repeated drop tests from five feet (1.5 m) above the ground, no damage occurred. Furthermore, whacking it with a "small urethane" hammer created no scratching or breakage. LG wasn't very specific about how it has accomplished this feat, but it was revealed that the company "developed a unique technique to utilize the high TFT process, typically employed in general LCD manufacturing and with temperatures exceeding 350°, in the production of its plastic EPD ... overcoming the obstacles associated with applying the existing production process to heat-susceptible plastic." The displays will be made available to original design manufacturers (ODMs) in China immediately, with completed products to be available in Europe first. Presumably, we will begin to see them here shortly thereafter.